If a person engaged in an unrighteous act during the time when the Ark was placed in it’s home and the Altar was set up for Israel, then that person would approach one of a crack squad of men especially chosen and trained in being the perfect, concise, clean and authorized agents to take that person’s offering and fulfill whatever actions needed to be undergone in order that it remained acceptable in the eyes of the Creator, to whom it was offered. This is ignored by the many Christian voices that call out, ‘but He demands blood’. One of the wonderful and liberating facts that I learned early on in my route away from the Church is that God never demands blood. We, as humans, have full control over what we are willing to give and how we give it. Our will to repent for example. It’s remarkable just how many times the King of the Universe says of Israel, ‘return to me and I shall return to you’. Not, slaughter enough cows and I’m yours, not ‘bring me the sheep’ and certainly not, ‘wait awhile and I’ll deliver a human for you to kill’. In fact, Ezekiel 18, a chapter of the Tanakh in which we can read the actual words spoken by God to the prophet for the benefit of His people, says in explicit content of the way humans can repent should they so choose and of the response of the Creator if this act is undertaken. What really amazes me is the half measure though. The Christians ‘use’ of the Tanakh to steady their point. 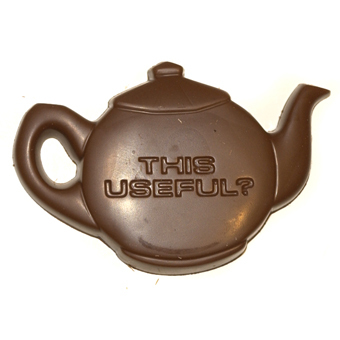 It’s a little like a Chocolate Teapot, it’s only any good from a distance and won’t at all work in practice. The man Jesus died not on an Altar but on a cross. Not an especially selected offering but one of some 100000 Jews put to death and executed. Not prepared and cherished, but spat on, bruised and beaten. Not perfect and unblemished but ripped, bloody and torn. Not handed to the especially chosen family of priests to maintain a clean and holy link to the sanctified ritual practice of the Temple as instructed by the King of the Universe in the Torah but arrested, beaten and murdered outside the city walls by a pagan and foreign nation. A nation who later founded the church, a church that elevated this story and sold it to the other pagan nations. Even if we ignore the many issues that another ‘man’ dying for ‘my’ sin brings.. then we are still left with the fact that a pagan execution is not a biblical and acceptable sacrificial sin offering and if we choose to believe this then all this can leave us with is a hot chocolaty mess in our laps.